Reactive Machine Learning Systems teaches you how to implement reactive design solutions in your machine learning systems to make them as reliable as a well-built web app. This example-rich guide starts with an overview of machine learning systems while focusing on where reactive design fits. Then you’ll discover how to develop design patterns to implement and coordinate ML subsystems. Using Scala and powerful frameworks such as Spark, MLlib, and Akka, you’ll learn to quickly and reliably move from a single machine to a massive cluster. Finally, you’ll see how you can operate a large-scale machine learning system over time. By the end, you’ll be employing the principles of reactive systems design to build machine learning applications that are responsive, resilient, and elastic. 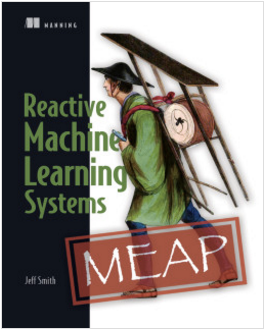 Please enter your information to receive your E-book copy of a subset of Reactive Machine Learning Systems by Jeff Smith and be signed up for the Lightbend Newsletter. Once you've entered your information and submitted the form, the PDF will be emailed to your address.